File this one under "Crash and Burn". 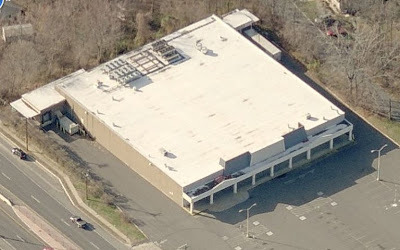 Located in Freehold New Jersey, this abandoned Acme opened on February 22, 2005 and was shut down just 21 months later on November 2, 2006. 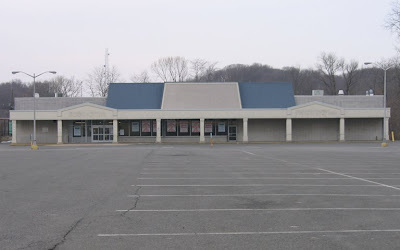 The Acme in Marlboro New Jersey, not far from this store, was closed for good the very same day. That location will be featured in a future post. 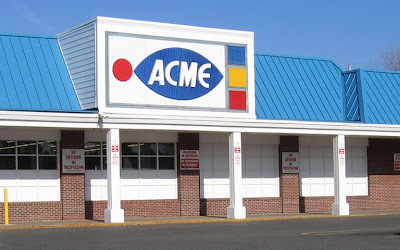 Acme released a statement explaining that this location was not meeting the sales numbers it needed to maintain a profit. 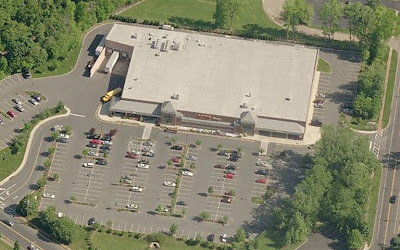 Acme offered to sublease the property to any interested supermarket chains but did not give specifics as to Acme difficulties in attracting enough business. This store was part of a new, rather nice shopping center. 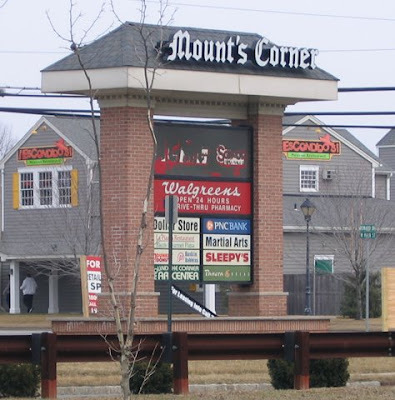 It was built right next to an older shopping center that has a SuperFoodtown. I visited that store while I was in the area and was surprised Acme was not able to compete. 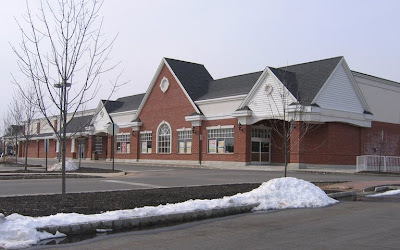 The store was very busy as there are many large housing developments in the area. Very dark inside and loads of tacky decor. Perhaps the SuperFoodtown's prices were much lower than Acme's. Sign by the street. Larger version posted below. Looks like they tried scrapping off the paint. I have to say... this is one of the most attractive facades I have seen on an Acme. Matched the look of the rest of the shopping center. It's pretty rare these days to see a grocery store with so much decorative detail on the exterior. Couldn't get any interior shots. There was construction going on inside. The store has been divided in about half with a Top Tomato Superstore taking over the left side. They had pictures in the windows of other Top Tomato stores to show what was coming. Extremely unimpressive. Produce and merchandise stacked to the ceilings. Looks more like a discount grocer. The right side of the store still has Acme decor. Looked like a realtor was giving a tour so I couldn't get pics of that side either. This sign is at the entrance from Wemrock Road. This sign is in the front of the shopping center on West Main Street. 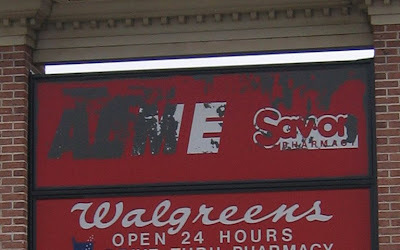 Here's a look from Live Maps with the Acme/Sav-on signage on the front of the store. Can you believe an Acme like this still exists? I genreally don't show stores that are still open on this blog but couldn't pass this one up. 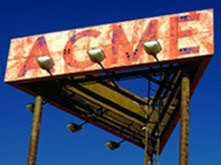 As far as I know, this is the last Acme to still have this sign. It's located in Manasquan New Jersey, very close to the shore. Just about a 15 minute ride down from the abandoned Acme in Belmar. 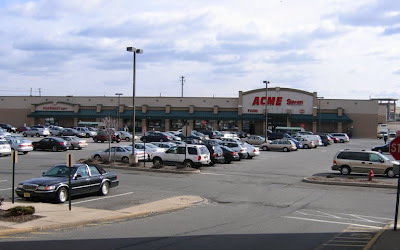 Not sure when this store was built but this exact style of Acme was built in several locations including Belmar, New Providence and in the Philly suburbs. Plenty of "No Loitering" signs. Clearly a problem at this store. When I was there on a sunny Saturday afternoon, there were all sorts of shady characters hanging out on the right side of the store. It appears that some sort of restoration work has been done on this sign. The colors are too vibrant to have lasted all these years, especially in the salty shore air. Looks like the colored sections have been carefully repainted. Hopefully this summer I will get a picture after dark with the sign lit up. Here's what the wall decor looks like. I believe this look was rolled out in the early 90's. It was commonly put up in stores that had the 80's remodel but needed a bit of refreshing. I think it was inspired by the 80's checkerboard floor which remained in stores that had these wall treatments put in. It was also similar to the 80's look with the arches on either side of the department name. I will be posting pics of the mid-80's look in a later entry. The other departments had different color combos of the painted tiles but were not nearly as striking as the blue and green combination seen here. I was in several Acmes in the 90's that had this blue and green look throughout the whole store rather than different colors for the various departments. This store appears to have never had a full scale remodel. The 70's produce floor is still intact! Wasn't sure if I would ever see this again. (See below) The layout of the store has been virtually unaltered over the years. The Customer Service Dept and office are still intact. Most stores had these areas removed or closed in for the 80's remodel with a customer service stands added to the front of the stores. 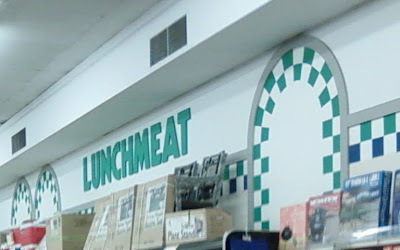 Funny thing about this store is that the bread is no longer located under the "Bakery" wall graphics in the last aisle. The dairy cases have been expanded into this section as well as shelving for other products, but no baked goods. I refer to this as the "Faux blue and red slate tile floor" in other posts. The rest of the store has been re-tiled in all white. 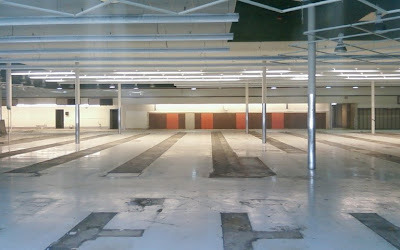 Gone are the red and brown Meat Dept tiles and the gold and brown Bakery aisle tiles. 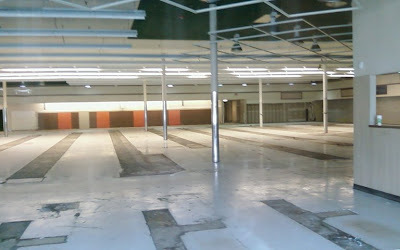 Thankfully they decided to leave the old produce floor. One of Acme's best design elements... ever. 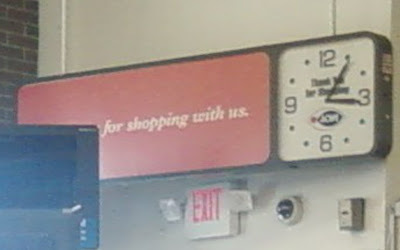 The Acme clock... with "fish-eye" logo still intact! Cell phone pic so it's not a great one. Live Maps snapped a pic of this are before the awning of the store was recovered in blue. This is one of the best conversions of a former pitched-roof Acme that I have seen. This image comes to Acme Style courtesy of Josh's Photostream on Flickr. 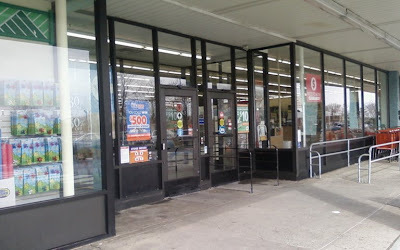 Josh has an extensive collection of photos of former Acmes as well as other grocery stores. He has kindly given his permission for me to share his pics here at Acme Style which I will be doing from time to time. No hope of me getting to all the locations Josh has already photographed. Click here to check out his collection on flickr! I would love get to this store to see what Whole Foods has done to the inside. Certainly no expense was sparred for the conversion. I would guess that they put in some sort of drop ceiling but then again may have left it as is since Whole Foods embraces unique architectural elements in their stores. At the same time though, a space such as that is challenging to heat and cool and wouldn't fit well into Whole Foods "green" policies. 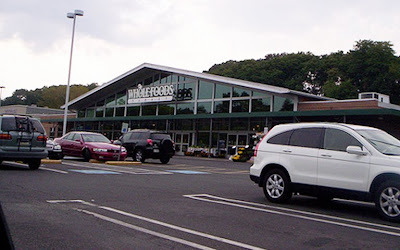 It is nice to see that Whole Foods preserved the look of the front of the store rather than buiding some sort of awning that blocked the pitched-roof. Here's a pic from Live Maps. Looks like Whole Foods expanded on 3 of the 4 sides of the store. 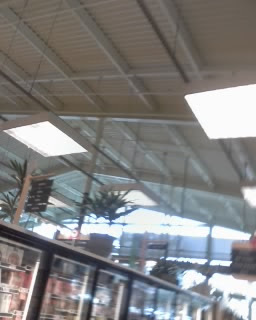 UPDATE 4.6.09: Josh has sent Acme Style a picture of the interior of the Whole Foods store... the pitched-roof is intact! 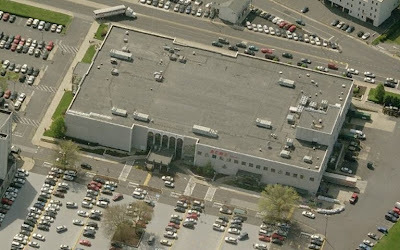 The pitched-roof store closed in 1997 and Acme relocated to this building which appears to be a former department store. 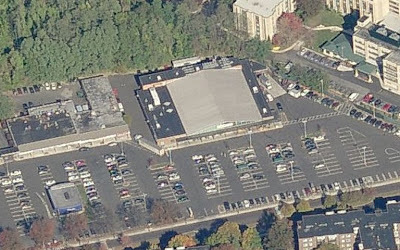 Quite a unique location for a grocery store. Not sure if the Acme takes up the whole building or not. Looks like it would be worth a road trip there to check it out! UPDATE 4.6.09: This building was originally a Bloomingdale's. 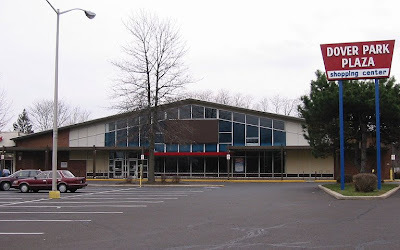 It opened in 1971 and relocated to the Willow Grove Park Mall in 1982. 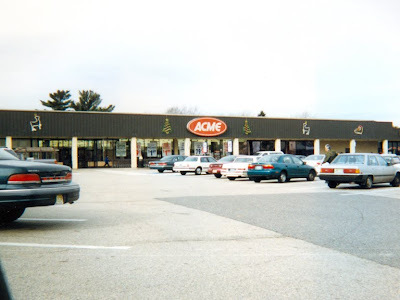 Acme took over the space in 1997. Thanks to Josh for the additional information! 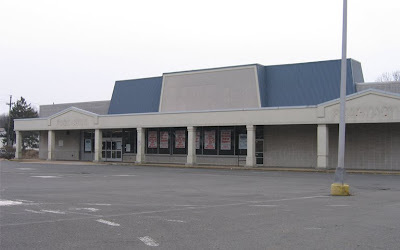 UPDATE 11.25.09: Several emails have come in saying that this site was a former Lord and Taylor. Another abandoned Acme. But this one has a happy ending. It was replaced with a brand new Acme just down the road. Unfortunately I wasn't sure how to get to it when I was visiting this location. Not familiar with the area so I didn't try to venture to the new store. Turns out I could have practically walked to it. 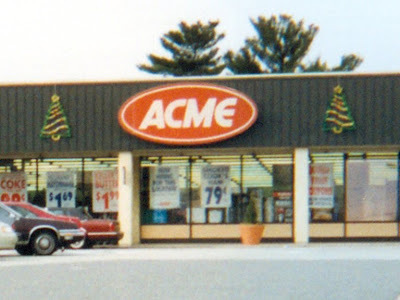 Clearly this Acme was quite successful despite it's relatively small size by today's standards. I count only about 8 or 9 grocery isles. 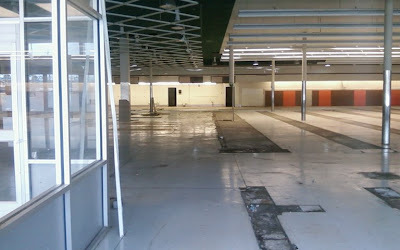 A large portion of the left side of the store was cleared out to create the "market" area with the produce, deli and bakery departments. 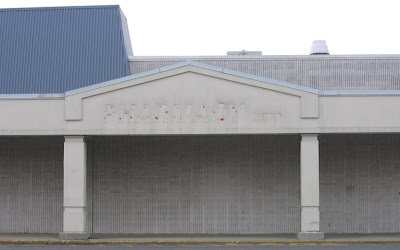 The pharmacy was most likely on the front right side of the store where the bakery used to be before the 90's remodel. Looks like 7 registered lined the front of the store. This is one of the most extensively remodeled stores I have seen of this size. Acme shut down most of the these types of locations with the 80's remodel package still in tact. Both the interior and exterior received extensive upgrades in the 90's. Painting the awning blue was a much better choice than the green color used to paint most old Acme awnings. "ACME Sav-on" lablescar. The signs in the window list the address of the new store. Unusual entrance. 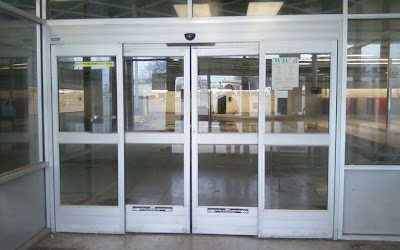 Shoppers entering and exiting through the same doors. There wasn't an exit door at the end of the registers. The 70's Meat Department wall panels still intact after the meat cases were removed. The "market" area over the to left. Not sure what that lit up service area was. Floral perhaps? Customer Service Dept most likely there on the right. The Pharmacy Dept just beyond it. 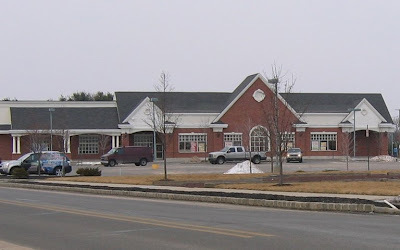 This 33,000 square foot location closed on July 26, 2007 and the new 54,000 square foot store in Fieldsboro opened the very next next morning. Just one click of the rotate tool on Live Maps and this Acme goes from being open to being closed. 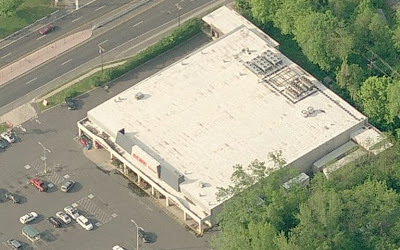 A closed pitched-roof Acme on Sunnybrae Boulevard in Yardville NJ. Not sure when the location closed but it looks like it made it well into the 90's, if not the 2000's. Here's a look from Live Maps. 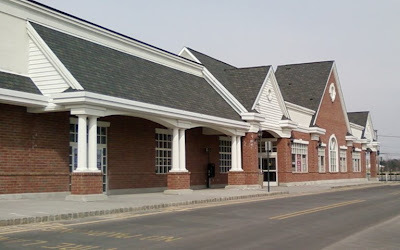 The right side of the store was being converted to a CVS while the left side was broken up into some smaller shops. 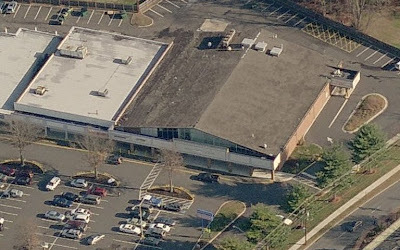 Here's the CVS after the conversion. 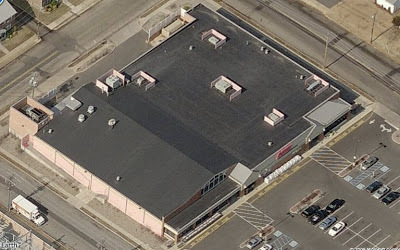 And finally the replacement Acme that was built just down the street from the old pitched roof Acme. UPDATE 5.27.09: I visited this Acme a few weeks ago. It's hard to miss... signs all over the highways leading you to the store. 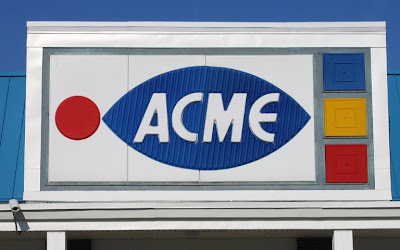 Looks to be one of Acme's most successful stores. The interior is radically different than any other Acme I have been in. Classic 90's/American Stores building but has been drastically remodeled since it first opened. The arched windows in Produce (on the left side) have been covered over. 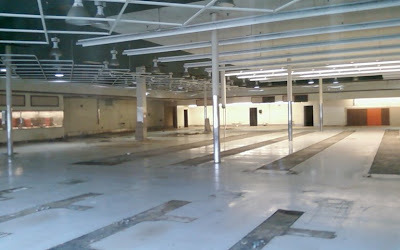 The Deli and Cheese departments are where Produce used to be. The Bakery is in the back with the Produce cases facing the service departments. The layout of the rest of the store is similar to the 90's floor plan. But the decor? Very over the top. Not Acme's usual style at all. 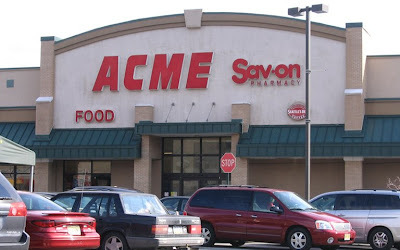 If I had only seen the interior I would swear Acme took over the building from another supermarket. The signage on the outside is now white instead of red... a very recent... and necessary change... that Acme has made recently The red lettering read very poorly on brick facades. The white lettering, although not attractive in it's own right, pops nicely on the brick. I snapped a couple of phone pics while I was inside but have lost them. Check out this Acme in Ocean City NJ! It started out as a pitched roof building which had a huge addition added at some point. Looks like the addition swallowed the old store! 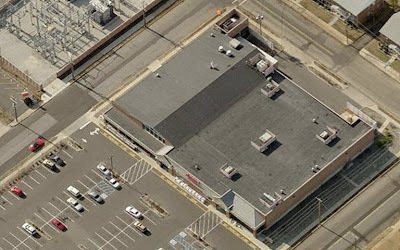 So much to discover on Live Maps when researching old Acmes. What would I do without it? Update 4.6.09: I found a picture of this store from street level. Turns out the pitched-roof is still intact on the inside of the store. No drop ceiling put in. You can see the lights lining the ceiling. 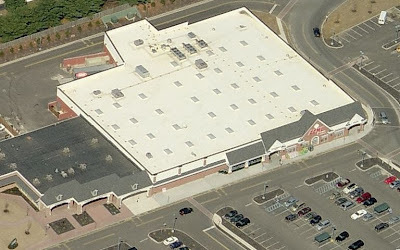 Most pitched-roof stores that have been expanded have a ceiling put in that lines up with the ceiling in the addition. And the stores facades are usually built up to cover the the old half of the store. Thankfully that was not done at this store! 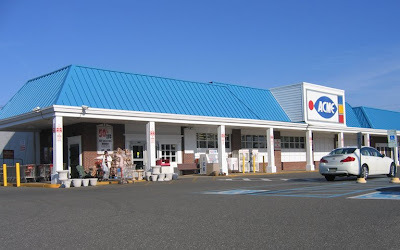 Update 7.15.09: Ocean City NJ is preparing for Acme to close the 34th Street store. The township is reconfiguring the entrance and exit to better accommodate future tenants. 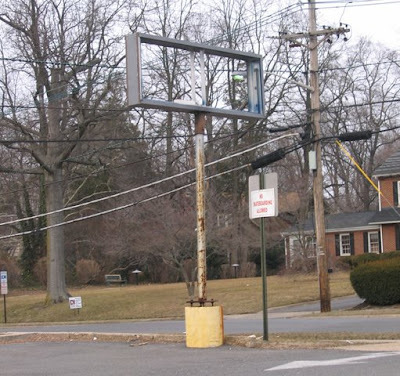 Zoning rules are also being changed to prevent a gas station... mainly Wawa... from moving in. Acme denies having any plans to close this store and is already in the process of remodeling this location. The township however, is certain the new ShopRite opening on the mainland will finish off this store for good. 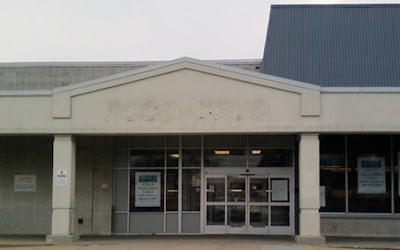 This was the former location of the Acme on Rt. 46 in Clifton NJ. Opened sometime in the 60's or 70's. 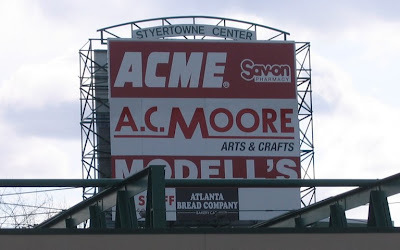 I would guess that Acme signed onto this location after plans for this shopping center were already developed. The store was lacking many of the physical characteristics common of Acmes of that era. Most unusual was that the dairy department ran across the back of the store. 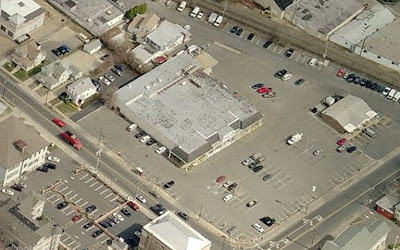 The Meat Department and Corner Deli were along the far right wall. UPDATE 7.14.09: When this store first opened the aisles ran parallel to the front of the store. With this set up the Dairy, Meat and Deli departments were in there usual areas. 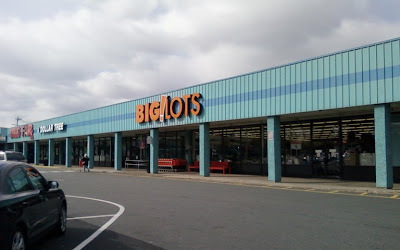 The aisles were switched years later when the neighboring store left and the entrance to the Acme was reconfigured. 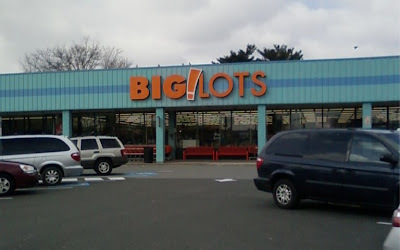 This store did have the red oval logo... right where the Big Lots logo is. However, it was passed over during the 80's remodel. 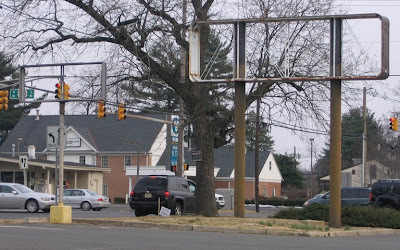 The sign was probably changed due to the shopping center upgrading the facade. 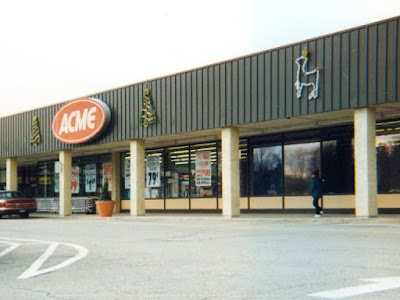 This Acme had it's 70's colonial decor until the late 90's when the walls were painted white and the blue and beige wall graphics were put up. 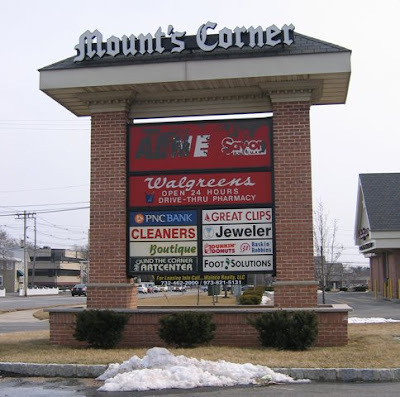 You can see this "look" in the posts of the Newton and Belmar stores. 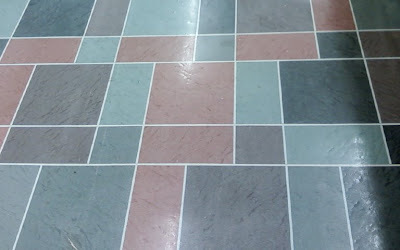 I believe the floor tiles in the Meat and Deli department were replaced with white. The slate tile look of the Produce Department remained until the end. The entrance was set up similiarly to other Acmes of this era. I believe the store had 10 aisles. 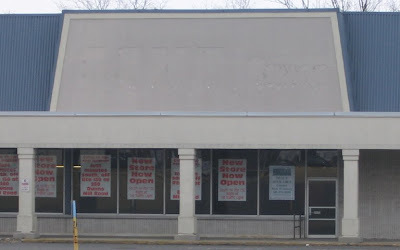 It closed around 2004 or 2005 as it's replacement store was ready for it's Grand Opening! UPDATE 7.14.09: The old Clifton Acme opened in 1959 and closed on February 2, 2004. 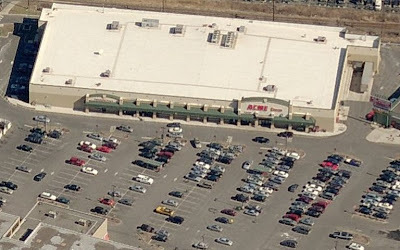 The new Clifton Acme opened the next day on February 3, 2004. The brand new Clifton Acme on Allwood Road just off of Rt. 3. This location had a Starbucks when it opened. That round sign used to have the Starbucks logo. I believe it's some other coffee shop now. Not sure why Starbucks left Acmes... will have to research that topic for a later post. This store has competition from two nearby Stop and Shops. 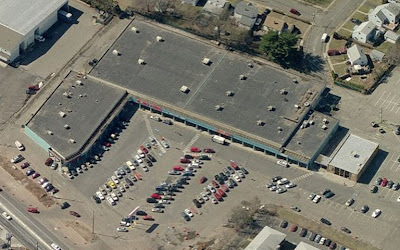 The S&S to the West is currently being torn down and replaced with a Super Stop and Shop. It appears that Acme is benefiting from the temporary closure of that S&S. The parking lot always seems to be full these days. An interesting aspect of this Acme is that it was customized for the community. Apparently Clifton has a large Jewish population and this store was set up clearly marked Kosher section. There is even a regular Deli and a Kosher Deli. I have seen reviews online that rave about the Kosher selections in this store. This sign is right off of Rt. 3. I have been passing this are on Rt. 3 regularly for years. I never saw this store being constructed... it just seemed to appear out of no where one day. Must have been a challenge to build in this tight space.